How To Cook Manhattan Clam Chowder is a tomato based soup with Portuguese roots. Back in the late 1800’s Manhattan clam chowder was called New York clam chowder. I like Manhattan clam chowder because it is healthier than New England clam chowder and I enjoy the spicy broth. 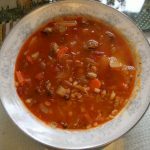 In the 1930’s Manhattan clam chowder became known as it’s current name. Manhattan clam chowder has also been called Fulton Market clam chowder or Coney Island clam chowder. 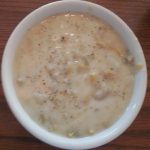 Manhattan clam chowder is easy to make and the below recipe and video will show you how to cook this mouth watering soup. Manhattan clam chowder is a much lighter type of chowder than New England clam chowder. Steam 15 me. Chowder clams in 2 quarts of water until the clams all open. Filter off the clam stock to carefully remove any leftover sand. Using a Cuisinart liquefy 4 tomatoes and simmer for 15 minutes until they become a rich tomato sauce. Bring clam stock to a boil and add the tomato sauce. Add 1 tablespoon of both fresh thyme and dried celery seed along with 2 table spoons of freshly chopped garlic. For spice add 4 tablespoons of Sarachi sauce to the stock. Boil your clam stock for 15 more minutes on high heat. Add 2 finely chopped potatoes,1 white onion, and carrots. Clean and chop clams add to stock pot. Simmer for 10 additional minutes Add 2 teaspoons of black pepper, parsley, and sea salt. Know you can plate up your Homemade Manhattan clam chowder. This great Manhattan Clam Chowder is very tasty and does not pack on all the fat of New England Clam Chowder. Is the Manhattan Clam Chowder the best recipe for real chowder, The Bald Chef thinks so! My Favorite Soup. I have my own recipe but I am going to try this for sure. I do not have access to fresh clams that I trust to eat here in Indiana so I use bottled juice and canned clams. yea man, I first heard about you through ManCaveMeals. Love his channel and I’d figured who ever he said was a good cook must be, and sure enough you do have a great cooking channel!